The Ardo of Chanchaga, Mallam Abdullahi Babayo, has called on herdsmen to stop using minors as cattle rearers to avert clashes with farmers. Babayo who is also Sarkin Fulani Chanchaga and Shaku Kingdom in Minna made the call in an interview with the News Agency of Nigeria (NAN) in Minna on Wednesday. He said that once herdsmen stop engaging minors in the service of cattle rearing, it would radically reduce clashes with farmers. “It is outrageous for an underage boy to lead herd of cattle, in an emergency such a boy will be stranded. “It endangers not only the boy and the society but even the cattle as cattle rustlers take advantage of the young lad to rustle his cow and cause mayhem. “A farmer can be very upset seeing an underage boy with a herd of cow. “There is this sign of relief and confidence farmers enjoy when they see cattlemen leading cattle to graze, they feel their crop is safe,’’ he said. 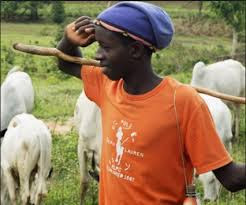 The Fulani leader also called on farmers to respect designated cattle tracks and avoid farming on them, so as to enhance harmony and peaceful coexistence between them and herders. “The farmers rely on their crops while the herders also depend on their cattle for livelihood and so they must learn to respect each other’s concern for good neighborliness,’’ he stressed. Babayo them to resolve all misunderstandings legally instead of resorting to violence. “All sides should sheath their swords and coexist peacefully for the progress of the state and the country at large,” he added.